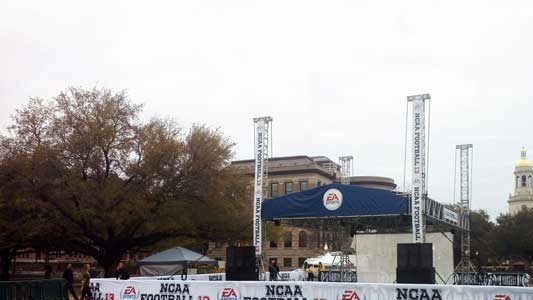 Outdoor events and activations are in a class by themselves. In addition to the difficulties of production requirements, parking and crowd control, you also have to add fencing, porta-potties and the tempestuous moods of Mother Nature. 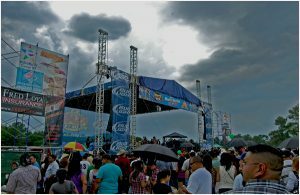 In this post, we’ll discuss how to plan for bad weather conditions at live events and the specific conditions that our technicians are trained to look for when determining whether or not to continue an event in bad weather. In our home State of Texas, weather can be… fickle. 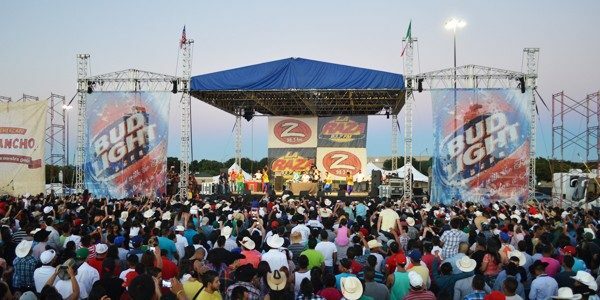 It’s an old joke here that “If you don’t like the weather in Texas, just wait a minute and it will change.” Of course, our touring and logistics groups handle activations and experiential events all over the nation. We’ve been drowned in Denver, deluged in Duluth and snowed on in St Paul. We’ve been hailed on in Helena, had sleet in San Antonio and tornadoes in… well, you get the idea. The point is we are very experienced with bad weather conditions at live events and how to make sure the equipment and your attendees are safe before, during and after bad weather strikes. As a production company, we have to be ready for all types of weather at an outdoor event. Rain gear and pop-up tents are part of every single pack that goes on the truck. All of our electrical distribution systems are water resistant and rated for outdoor use. Our ballast plans for our rooftops are specifically designed with high wind conditions in mind. Speaking of rooftops – whenever we do a stage and roof system, we will always have a roof tech on site to monitor the roof and the weather conditions at any time there is activity on the stage. On most of our outdoor rental stage and roof system builds, you’ll see a weather station including an anemometer and a rain gauge on the structure. Monitoring the weather at all times is a big part of our commitment to safety on the event site. After the rain – back to the show! Especially when using rooftops or mobile stages – it’s imperative that production company that you have contracted has a bad weather plan. With our company, it’s our Rooftop Emergency Procedures. This document has very specific tolerances for wind and rain and clearly explains our responsibility to our clients in case of bad weather. In addition to this document, it’s also important for everyone to sit down long before the event and discuss the issues related to bad weather conditions at live events. The promoter, production company, venue owner and (if possible) the municipality should all be given well-defined roles and responsibilities for dealing with bad weather. Knowing these roles beforehand can save precious minutes and provide a well-organized response for attendees. Do you have questions about weather and your outdoor activation, concert, or festival? Ask a Question of the bad weather safety experts at In Depth Events. We’re happy to take our knowledge and experience and apply it to your event. We look forward to hearing from you and working with you! The ADA, or Americans with Disabilities Act, was signed into law in 1990. For staging vendors, it mandates on a federal level the use of handrails and ramps on temporary and permanent stages. 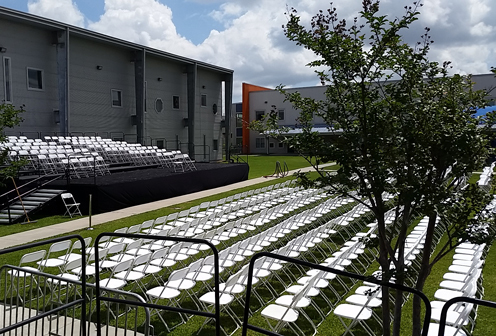 In addition to compliance with the ADA, graduation stages must also comply with municipal building codes for staging and structure builds. Some municipalities will also require review by the county Fire Marshall for safety and accessibility. It’s incredibly important that your stage meets or exceeds local building codes as well as ADA requirements. The most successful staging vendors will verify building codes, ADA requirements and fire code requirements long before they arrive to setup your stage. Look for staging vendors who are Certified Building Contractors within your local municipality, or the nearest large city if you are in a suburban or rural area. 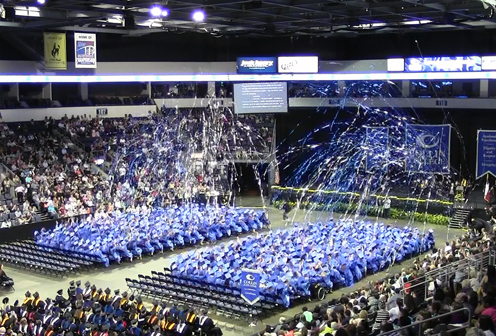 We have been providing graduation stage rentals for many years as well as other production and rental services. Chair rentals, sound system rentals, press risers and audience risers are all within our range of services to our clients. Ask Us a Question today and find out why our clients return to In Depth Events event experts year after year. We look forward to hearing from you and working with you! Most live event marketing campaigns are based around other, larger events. 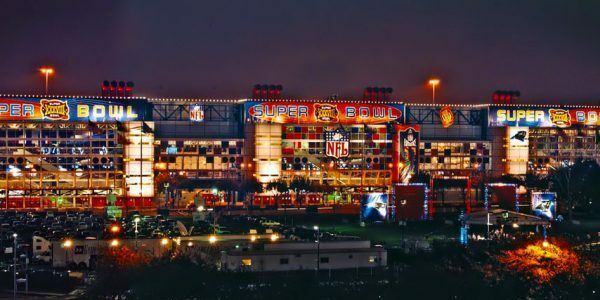 From concert lounges at SXSW, to sports apparel promotions surrounding the NBA All Star Jam, smart marketing teams combine their brands with the targets expected at national level events. 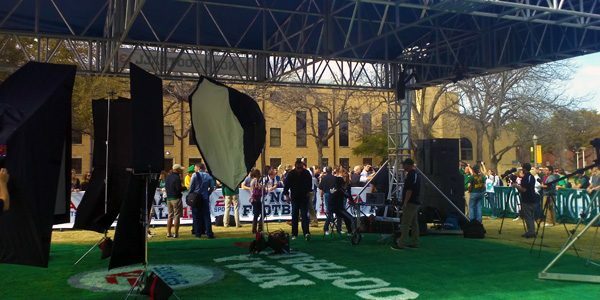 The geniuses promoting the Conan O’Brien show targeted the hoopla surrounding NCAA March Madness in Dallas. A weeklong mini-tour using a branded Conan O’Brien Airstream trailer was dispatched, and guests were treated to live music, memorabilia, and Conan giveaways. Each tour drop was centered in an area guaranteed to have lots of walk-through, targeted traffic. 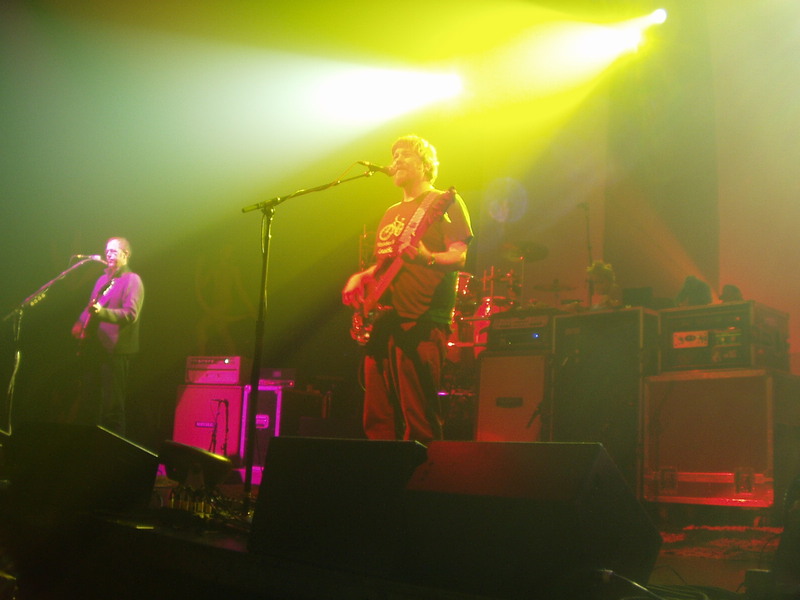 Production Experience was contracted to handle the power needs, staging, audio, and lighting for each tour drop – as well as providing an ADA lift for disabled guests. Even with tight turnarounds, the crew of Production Experience performed flawlessly, and the end result was a very successful promotion for the show. Find out how our event experts can provide production for your live event marketing needs – contact us today! 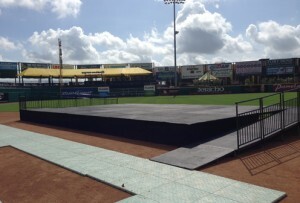 It’s better to have your stage and roof systems on high ground for a variety of reasons. It’s better acoustically, because it allows the PA to throw farther. It’s helpful for visibility as well. Most importantly, if it rains, then the performance area doesn’t get flooded out. All stage and roof systems need to be guyed down. In some cases, we’ll use ground stakes to guy a rooftop down. However, if the rooftop is to be placed on concrete, or in a grassy area where power, gas, or sewer lines are underground, we’ll use water ballast. It’s important to know which type of points we’ll be using long before our trucks arrive. All production companies want you to have a successful event. However, we need your help to make this happen! First and foremost, make sure you or a senior member of your staff is on site at the pre-arranged load in time to show the crew exactly where the rooftop is going to be placed. Have a printed version of your overhead and a printed version of the schedule of events ready for the production crew chief. 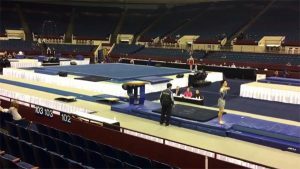 This simple step will solve the majority of timing and placement issues. The production crew chief will need to be able to access a senior member of your event staff at all times during the event. If you are using radios, make sure he has one assigned to him and knows where to charge it up during off times. If you are using cell phones, make sure to swap numbers and check them. Communication is key! All banners MUST BE made of blow through material. Flat vinyl banners will not be hung. Smilies are not acceptable. All banners must be grommeted on all four sides. Grommets must be placed on 18″ centers. Our crew chief or rooftop supervisor has the final authority on any banners hung on our structures. All banner art should be above center. The most common banner placements are teaser banners (above the stage, on the downstage truss), backdrops and flybay banners. At In Depth Events, we are rabid about the safety of your talent and your attendees. We make every effort to make sure our structures are safe, and we will always have a rooftop operator on site to make sure that all components are functioning properly. In fact, in many cases, we’ll use portable weather stations mounted to the rooftop itself to monitor weather events in real time. Your on-site operator will always be watching for one of four occurrences that will cause us to bring the rooftop down. #1: Heavy rain. Drizzle and small storms don’t affect us. A raging downpour does. If you see frogs coming from the sky and small rivers forming, we will bring the rooftop down. #2: High winds. Our roof systems are rated for moderate winds, but high winds will cause us to bring the roof down. If you see Dorothy and Toto, it’s time for the roof to be lowered. #3: Lighting in the area. Lighting strikes within a few miles of our rooftops are bad news. A metal structure higher than anything else around it is a natural conductor. Unless you want your hamburger well done, we’re dropping the roof. #4: Someone runs a car into one of our uprights. Yes, this really has happened before. If someone driving on your show site manages to hit the large aluminum structure in the middle of the event area, he’s probably hit it hard enough to impair the structural integrity. The roof needs to come down and be checked. In most cases, we can re-raise the roof and continue with the show once the danger has passed. However, the rooftop operator has sole authority on lowering the roof and on re-raising it. If your rooftop operator tells you it’s time to bring the rooftop down, there is a good reason for doing so. 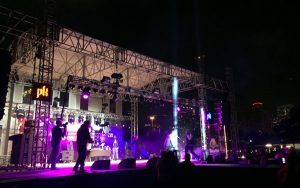 As a live event marketing professional, I’ve been honored to be a part of some amazing live event marketing campaigns. When Verizon began to enable FIOS in the major US markets, I was selected to be a part the live event marketing group for one the largest fiber-optic roll outs of the new millennium. 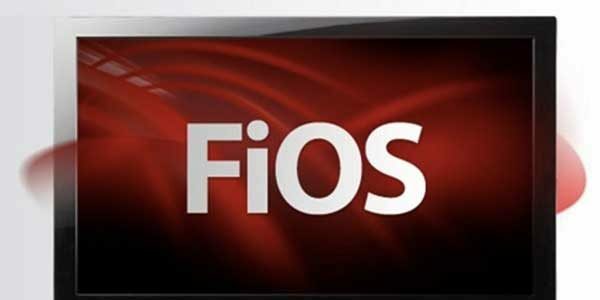 At the time, FIOS was a new entity, and our job was introducing it to folks that weren’t familiar with all it’s intricacies. This was a live event campaign across the country hitting all the major cities in states such as New York, Florida, Texas and California. We created a campaign that encompassed all key elements to execute a flawless marketing campaign. We named it FIOS FESTS. The following were elements that we implemented to ensure the best outcome possible for the client. 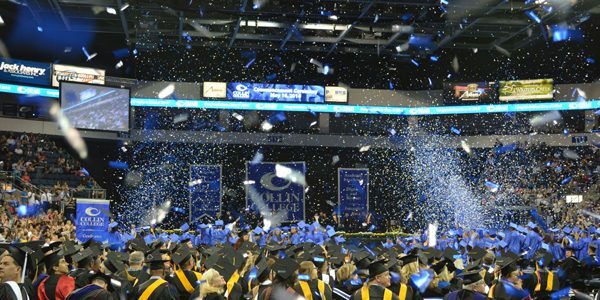 How we did it – by the numbers! 1. Pre-promote. Letting the local consumer base know where, when, what, and why in fun, creative ways to motivate consumers and drive interest for the live marketing event. For FIOS, we would set up in front of local businesses and speak to consumers one on one and offer fun incentives for their time. We also incorporated music by offering free music downloads from our site. For this campaign, pre-promotion was a key target for creating a great, well attended event. 2. Location. Finding a centralized location was another key factor in the overall execution of the FIOS events. With the FIOS FEST, we needed a football field-sized area that would hold several 20 foot x 20 foot tents, a fully loaded event stage and a footprint for vendors. Permits and approvals had to be obtained well in advance to avoid any last minute snafus that might have arisen. The idea was to make the event as accessible to as many of the locals as possible without having them make a major trek from end of the city to the other. 3. Production. For the FIOS FEST, and for every other event I’ve been a part of, the final and most critical element is incorporating the right production equipment. This will enhance and make sure your event comes across as professional endeavor and not some thrown together, last minute after thought. 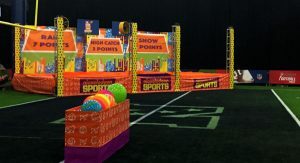 The stage is the focal point of any live event as it features the entertainment and contests going on throughout the day. For FIOS FEST, we used a SAM 550 mobile stage at each of our locations. This StageLine SAM550 model is the flagship of the StageLine fleet with a deck size of 50 feet x 38 feet and a load bearing rooftop capable of supporting 44,000 lbs. With flown Line Array, state of the art lighting, and (of course) FIOS banners, it made an impressive centerpiece to the FIOS FEST. From FIOS to Production Experience, Inc.
My experience with the FIOS FEST campaign, as well as several other live event marketing promotions, has made me a valuable addition in my current position as Live Event Marketing Manager at Production Experience, Inc. The main keys as listed above are my steps to executing a flawless event anywhere from a few hundred, to thousands of participants. As always, “Go big or go home”! Your target consumers are worth it and they deserve the best in execution with the right production pieces at the core. In the business of live event marketing, the key is reaching the most people as effectively as possible. Live events continue to evolve each year, incorporating more and more social media elements along with keeping the things that worked in the past. How can you step up your event game and have the greatest impact on the consumer? Size DOES matter in live events! Footprint size and location of said footprint is a great place to start. Size does matter in this instance. If you can be outside you really get more visibility and foot traffic than an indoor space. Don’t be afraid to spend a little more on a larger sized section. The extra investment always pays off with increased overall numbers and interactions. Location goes hand in hand with your footprint. Where do you need to set up to give your team the best opportunity to make the most impressions? Normally, if you’re just going for impressions; you should secure a spot near one of the entrances or exits. However, if you need interactions this may backfire on you as consumers are usually rushing in or rushing out – making it more difficult to engage your key demographic. I would suggest somewhere in the thick of the event at a corner where there is plenty of foot traffic coming from all directions. The next element to step up your event game would be your interactives. Consumers love sweepstakes and an opportunity to win no matter what the prize. Make it a trip, shopping spree or even cold hard cash. Anything that drives the consumer to your footprint and initiates conversation with the promotional professional. Once the consumer is captivated by the scope of your footprint and giveaway; now is your chance to impress with technology. Take your product or service to the next level with techno enhancement. 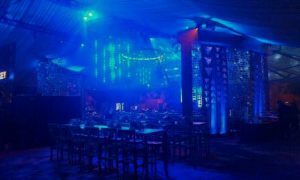 LED walls, professional sound, lighting and staging are all tools to bring foot traffic, and ultimately, close the deal. Be ready for the all the accolades to come pouring in from your live event marketing attendees – and from your end client! Oh…and don’t forget to have fun. This always creates a more welcoming environment for consumers when they see your team enjoying the moment. How important is the marketing campaign production vendor? A touring marketing campaign can be made or broken depending on the choices the marketing firm makes in the planning and during the entire run of the campaign. In today’s live event and experiential touring campaigns, production rental is a huge part of the event. 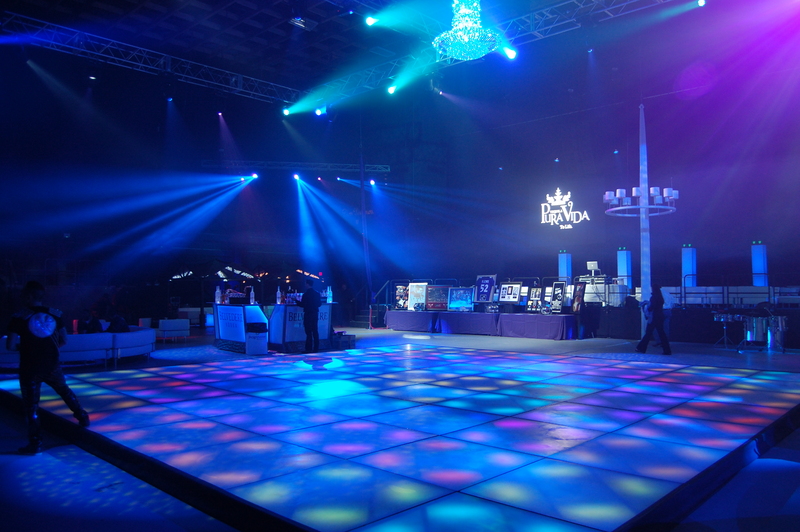 Choosing the right vendor for audio, lighting, video and staging rentals can make (or break) your activation. The number one key element for a smooth running program is having the right production support. Production elements such as sound system needs, LED Video Walls and décor lighting – can make or break your touring campaign. You are literally moving a footprint from one side of the country to the other with pitfalls waiting for you at every turn. It sounds daunting, doesn’t it? Why would any sane person even attempt this Barnum and Bailey circus? Get the attention your brand deserves – engage the consumer! Simply put – it’s the most effective way to communicate a brand to the consumer. Live event marketing allows a company to communicate directly to the consumer in a one on one dialogue. This has far more impact than a radio ad, print ad or billboard. Consumers want to feel special and unique – not just a number in an overpopulated society trying to step over each other to get noticed. 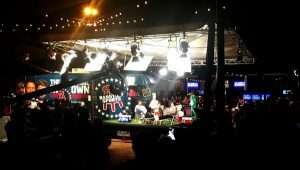 To get this attention, you’ve got to have a marketing campaign production vendor providing the technical requirements that make a live event possible. None of this could be possible without the right production support. In Depth Events to the rescue! With over 10 years of experience as a marketing campaign production vendor, we know how to get the circus from point A to point B in the most effective and efficient way possible while having your campaign stand out from the crowd. You have enough to worry about. Leave the logistics to In Depth Events and sit back and enjoy the show while clients rave about how well the campaign is running. 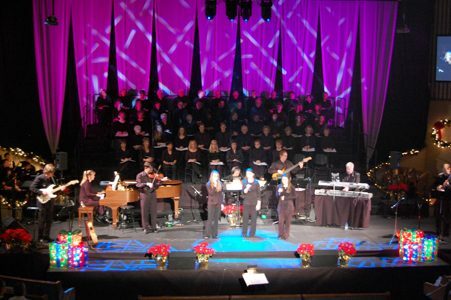 Staging, lighting, audio and promo vehicles are just a few elements we do best. You can’t have a successful campaign when you can’t communicate to your target audience. They need to be able to hear, see and experience the brand in a seamless fashion so they walk away with an experience they’ll remember for a lifetime. Get the right production support and take your marketing campaign to the next level. In this day and age of media bombardment, one on one interaction is becoming increasingly more essential to get your product or service in front of consumers. As the consumer interacts with a real person in a branded setting, the consumer gets the opportunity to ‘touch and feel’ – which increases brand loyalty. The need for this type of quality interaction has never been more important than it is today. The average attention span in 2012 was 8 seconds. I’m sure it’s gone down this year. Companies need to get in front of consumers. What is the best way to accomplish that? In my opinion, it’s Experiential Marketing – creating a memorable experience for the consumer in a short window. The days of billboards being effective as they once were are gone. Radio and TV ads are not even remotely as effective as they once were. Where does a company go to truly affect their bottom line instantaneously? Experiential Marketing, along with social media, can support a brand like no other marketing strategy. Cost effectiveness is one of the first thing companies look for when sourcing ways to promote and Experiential Marketing comes in at far less than ‘traditional’ marketing. According to On Board Experiential Marketing; the average cost per impression was $.04 compared to $.033 for a national magazine ad and $.19 for prime time TV ads. Clearly Experiential Marketing is the more cost effective way to go while getting in front of the consumer and maximizing that 8 second window. How does one go about securing the right marketing agency? Seek out those with experience, knowledge, and the right production company to support the campaign. Whether you’re looking to promote the latest razor or introduce the newest blockbuster movie, you need a marketing team that will work with you from start to finish. You must check references and do your due diligence when sourcing a marketing firm. How long have they been in business and what campaigns have they worked on in the past? These are just two of the crucial elements in selecting the right agency for you. Having the proper production support, including the audio system, staging needs, and generator rentals is critical to making any marketing campaign work. The staff at In Depth Events has been doing this for awhile and know their stuff. 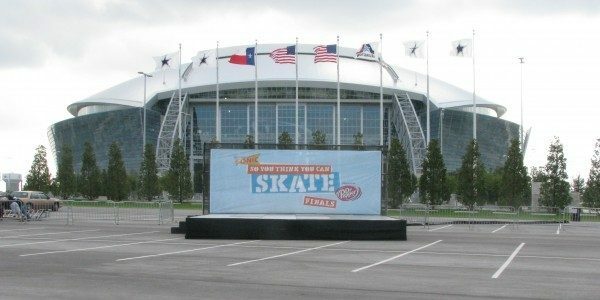 Based in the great state of Texas with a logistics team that goes all over the nation, the good people at In Depth Events have been supporting events and marketing campaigns for years – proving that they’re among the best at what they do with state of the art components. At the end of the day, an Experiential Marketing campaign, coupled with the resources of a top notch Marketing Firm and Production Company will help market and promote your next hot product or service for the best return on investment. Sit back and see the impact on your bottom line. So, you’re sitting at home, relaxing, and suddenly the light you are sitting under begins to flicker on and off and the wonderful smell of burning insulation assaults your nostrils. What do you do? Find your handy wire cutters and start snipping away? Get a glass of water and put the fire out? Ignore it and walk outside to watch the house burn down? No! You call the experts and tell them to get there as quickly as possible, right? Now, ask yourself what happens when a client asks you to hang twenty tons of LED wall in an outdoor environment. Do you go to your garage and pull out the old movie screen Dad used to show the slides of family vacations? Or do you call the experts? 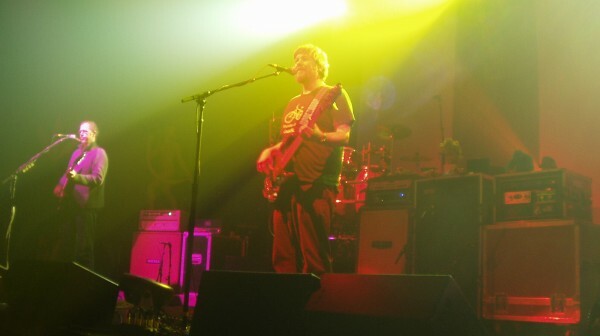 At In Depth Events, we’re the experts for all types of production needs. 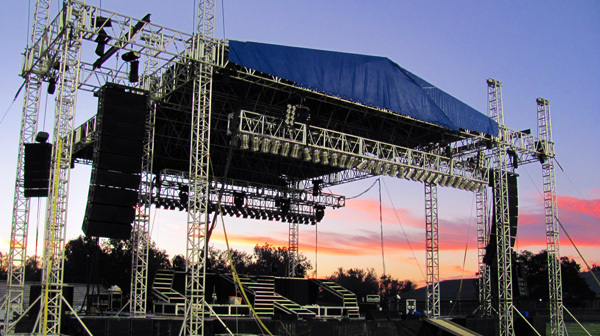 One of the many things we have experience in is load bearing structures for concerts and festivals. 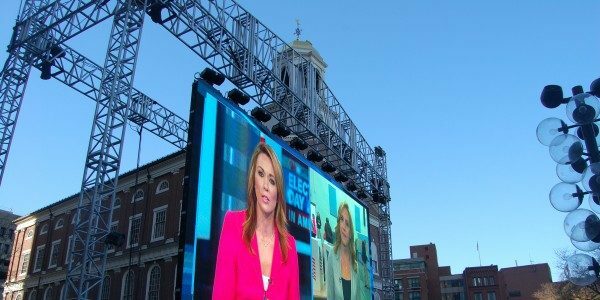 We’ve taken that experience and equipment and made ourselves one of the premier experts in the United States for load bearing LED screen supports. Very few companies in the United States have the experience or equipment to hang an large format LED wall properly. Even fewer have the ability to hang them in an outdoor, free standing environment. However, that’s just what we do. Our experts can hang your screen in a variety of applications on a variety of surfaces. Our trucking and logistics team can get our structures anywhere in the country. And, our network of structural engineers can satisfy the most demanding permit requirements. As a marketing professional, promoter, or PR firm, you owe it to your clients to choose the right expert for the job. Choose a company with the experience, equipment and talent to provide the best structure for your LED video screen – In Depth Events. 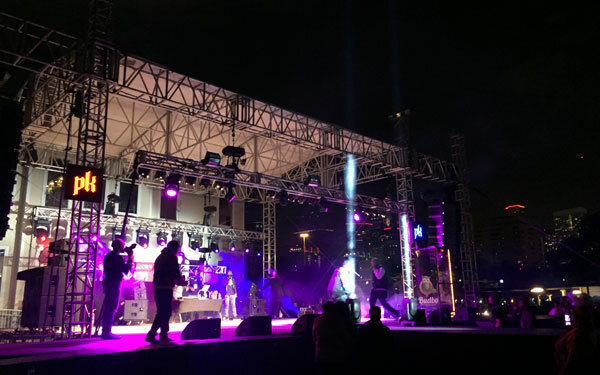 As a marketing or PR firm, the choice of the right live event production vendor for your live event can mean the difference between dizzying success or dismal failure. 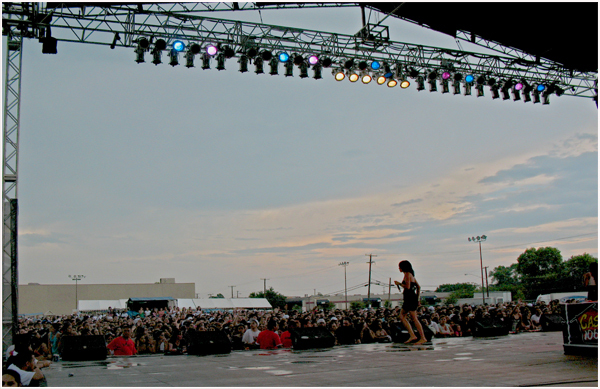 You need a company that can provide a safe, structurally sound stage and rooftop. A company that can provide the appropriate sound system for the venue. 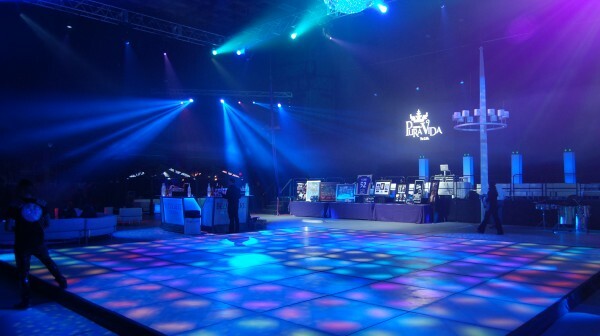 A company with experience in different types of lighting for different types of events. A company that knows how video can motivate an audience. And, hopefully, a company that can truck it all to your activation site, no matter what market your live event is in. If you are reading this and nodding your head, then you’ve found the right place. Our company, In Depth Events, is made up of experts at all of the above. Of course, anyone can SAY that, but how do you prove it? For us, it’s a simple matter of showing you our experience through the pictures of shows we’ve helped produce, a quick look at our repeat client base and the compliments of our past clients. Most importantly, however, is not our technical expertise. It’s the way we work with our clients. You’ll find that we speak your language and our friendly sales staff is almost physic when it comes to anticipating your needs. On site, our technical staff is willing to accommodate your client’s needs to an astounding degree. Our entire team is there to make your show look great, which makes you look great in the eyes of your end client. Does this sound like your dream company? For more information on In Depth Events and live event production vendor capabilities, please Ask Us a Question today. We look forward to hearing from you and working with you on your event!